The 2017 Hyundai Elantra receives a full redesign this model year, offering customers a stylistically fresh model that includes a more upscale cabin and even more high-tech features and amenities. Keep reading our full 2017 Hyundai Elantra review below to find out why this popular sedan is already turning heads in Arlington. 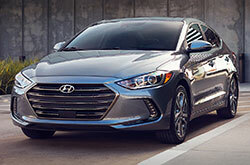 Exterior changes on the 2017 Hyundai Elantra near Dallas include a new hexagonal corporate grille that is featured on several of Hyundai's best-selling models. 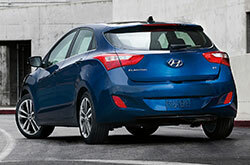 Edmunds.com likens the new Elantra to a smaller version of the Sonata, most notably its mature, upmarket look. Along with the new grille, shoppers will find more subtle creases and contours on the car's exterior, as well as a larger, more refined interior, a new engine option and an updated suspension. The 2017 Elantra is available in three well-equipped trim levels: SE, Eco and Limited. The base SE model starts things off with standard features such as 15-inch steel wheels, a six-speaker sound system, full power accessories, a CD player, a tilt-and-telescoping steering wheel and a manual transmission. If you choose to add an automatic transmission to the sedan, then the Popular Equipment package becomes standard with everything from 16-inch alloy wheels, cruise control and Bluetooth connectivity to smartphone integration, steering wheel controls and automatic headlights. The next-level Elantra Eco also comes with most of the features from the Popular Package, as well as LED daytime running lights, a leather-wrapped steering wheel, keyless ignition and entry, heated front seats and a hands-free trunk opener. Finally, the range-topping Limited model adds larger alloy wheels, leather upholstery, LED taillights, Hyundai's Blue Link system and a power adjustable driver seat. Standard safety features on the 2017 Hyundai Elantra in Arlington include front seat side airbags, a driver knee airbag, traction and stability control, side curtain airbags and antilock brakes. Available safety equipment includes a rearview camera, blind-spot monitoring, forward collision warning, rear cross-traffic alert and lane departure warning. Under the hood, the 2017 Elantra is powered by two engine options: a 2.0-liter four-cylinder found on the SE and Limited models, and a 1.4-liter turbocharged four-cylinder found on the Elantra Eco. The 2.0L four affords slightly higher horsepower than the Eco; however, drivers who are looking for the most fuel economy will find the Eco to your liking. 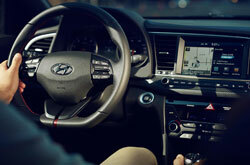 Visit Vandergriff Hyundai today to get behind the wheel of the all-new Elantra. To find out more information about this fantastic new compact sedan, continue reading our 2017 Hyundai Elantra review! 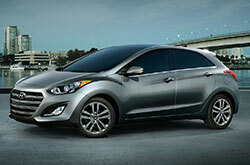 Considering a new car take home in the Dallas area? If so, don't just view the 2017 Nissan Sentra, Mazda3, Chevrolet Cruze, Toyota Corolla, Ford Focus and the Honda Civic; be sure to mull over the radiant 2017 Hyundai Elantra too. Its finely crafted styling and user-friendly on-board technologies may exceed your expectations and meet your needs. See if the 2017 Hyundai Elantra is a good match for your everyday needs, then browse our website to find up-to-the-minute information on limited-time dealership offers. As your go-to Hyundai vehicle retailer, we're the location to find manufacturer incentives on the Hyundai Elantra, as well as other new and Carfax 1-Owner vehicles. To help you make a confident decision when buying your next car, we've included this 2017 Hyundai Elantra review right on our site, making it a breeze to find the specifications you need. You are certain be impressed when you visit Vandergriff Hyundai to test drive the Hyundai Elantra; we encourage you to come experience the model up close. For those who are anxious to see it now, we've embedded a video walk-around that highlights its equipment.